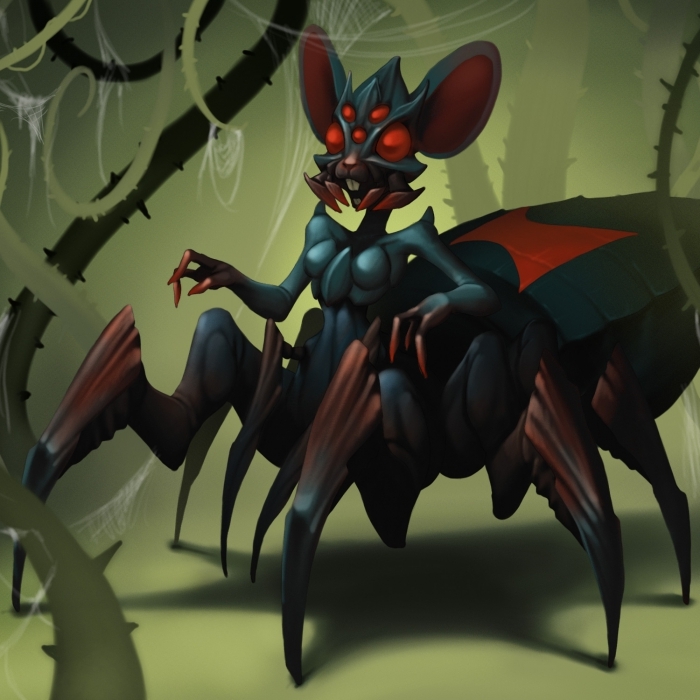 The Monstrous Black Widow Mouse is a breed of mouse found in the Whisker Woods Rift. Cheese: Lactrodectus Lancashire Charm: ?? Monstrous Black Widow mice have been found to be especially attracted to Lactrodectus Lancashire, to the point that any other kind of cheese will simply not suffice. The loot dropped by Monstrous Black Widow depends on the number of factions that are at 50 rage. Generally, she drops better loot as more factions are at 50 rage. With at least one faction, Rift Ultimate Power Charm is added to the loot; with two factions, Rift Ultimate Luck Charm is added to the mix, and with all three factions, Plankrun's Whisker Woods Rift Notes (if not already possessed) and another random item are added as loot. Monstrous Black Widow mice are weak to Rift Traps, and is the first Rift Walker mouse that is not susceptible to any other weapon power type. They can only be attracted by Lactrodectus Lancashire, which is only effective when all three factions have a Rage of at least 25. The probability of attracting Monstrous Black Widow instead of any other mouse goes up as a hunter has more rage. A hunter will generally need to use some funnel charms (Cherry, Gnarled, or Stagnant) to reach the required rage, since without them, the usual mouse population generally favors the first faction to reach 25 to reach that mini-boss before the other two factions have a chance to reach 25. Therefore, one strategy for getting all three factions to 50 rage is to start a cycle with normal hunting reaches 25 rage for one faction, then use funnel charms to get the other two factions to 25 (the chance of a +2 rage mouse from the first faction will make the other two factions reach 25 faster), then resume normal hunting to get one faction to 48 or 49, then resume funnel hunting until all factions are at 48 or 49. As long as no faction is at 50, then there is no risk of a mini-boss resetting rage and losing out on the chance for a Monstrous Black Widow. But as soon as a faction is at 50, the hunter has to switch to a strategy that reduces the risk of resetting rage by an accidental mini-boss catch, either by arming a Taunting Charm, or intentionally switching to a much weaker trap setup that can still catch the remaining regular mice needed while missing the mini-boss. Overall, the safest way to catch a Monstrous Black Widow without risking an accidental mini-boss catch is to reach the highest rage possible without hitting 50. Since funnel charms attract mice that can increase the rage by 6, any hunt with a funnel charm when the rage is 44 or over risks hitting 50. Therefore, funnel charms should only be used as long as the rage is 43 or below. When all three factions are over 43, the Monstrous Black Widow is at its highest attraction rate without risking hitting 50 rage on any faction. The Monstrous Black Widow Mouse drops the Enlarged Rift Egg and the Rift Venom Egg during the annual Spring Egg Hunt. Monstrous Black Widow mice were introduced on 28 January 2015, with the introduction of the Whisker Woods Rift. Monstrous Black Widow mice are the Rift version of Black Widow mice. This page was last edited on 27 May 2017, at 00:37.